So you’ve been told that your website is your best marketing tool. You know that when you need answers to ANYTHING you just simply refer to your friend Google – so yes, websites showing up in Google searches are imperative to any business. When someone is looking up “cake decorator near me” in Google, you hope your business will be right up there in lights right? But are websites worth the big price tag? Should you invest in your new website? Designers will charge anywhere from $2000 for a custom made WordPress site. And then if you need e-commerce features for taking cake deposits or selling cake toppers it will add another couple of hundred bucks. Then hosting – you’re probably on your own there. Find your own company and pay them directly. That alone will usually cost at least $15/ month. List building? You can use MailChimp which offers a free basic plan but if you need anything more high-tech, there’s another fee for that. And this may be a big reason why you haven’t placed getting a website high on your to-do list. When you’re starting out and don’t have a regular income from your cakes, can you really fork out that large investment? Now while I am ALL FOR having a website, I am known as a super tight-arse. Yes, I’ll admit it – I’m thrifty. Yes I understand developers and designers have AMAZING skills that I certainly don’t hold (correct, my husband Phil is a web developer and speaks in a foreign language to me about this tech stuff!) I totally appreciate that their skills and time need to be paid for. Remember when you bought your first car. I’ll bet you thought it was the coolest thing EVER! You saved up and spent a solid few thousand dollars on your new wheels. That’s a big investment. When you laid out that money you thought you had the coolest car on the block and couldn’t wait to show it off. And then as the years went by, and new technology came out, new models were built and the shapes evolved, suddenly you cool car wasn’t so cool. Pinky didn’t have power steering or air-conditioning… no way I’d be so in love with her these days! Website trends change at such a rapid rate you don’t even notice. Remember the menu bars in the early 2000’s that were down the left side? So totally uncool now. Did you know it was only 6 years ago that ‘responsive’ websites didn’t exist? 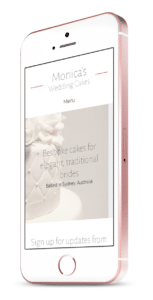 You needed to buy separate software to create a mobile website – standalone to your main website. Which meant maintaining 2 totally separate sites that didn’t communicate with each other. What?? Before you lay out that initial couple of thousand dollars, make sure you realise that you will need to rejig it again in the future. A website is not a ‘classic’ item that will forever be awesome. You will need to redesign it and modernise it as trends change. Or your business will be stuck in a time warp. Like a car without air-con. I’m sure you have heard stories about people with new businesses that have paid a ‘down payment’ to a web designer and heard crickets. Nothing. No action on the website front. I personally have never been in that situation but I have met many people that have had ‘issues’ with the first web person they have employed. They usually end up writing off that money and beginning the search again for a new person to help them. Starting from square one. And losing all that precious hard earned money along the way. Not all designers are sharks out there. And I’m sure these business owners have tried to go with the cheap option, or outsource the job to overseas. Or deal with someone that knew someone and not actually checked their work. Or possibly checked their work but taken the cheapest deal and ended up with the cheaper looking version of their sample work. It is the norm for designers to ask for 50% of the payment upfront and this is completely understandable. They need to know that you are serious before they commence work. The set up phase is super time-consuming. If you are a lucky one that found a great web designer and are happy with your website, well done! Off you go and 3 months later you realise you want to make a change to one of your information pages. Well there’s some more money you’ll need to hand over for your designer to login and make that change for you. Or you could get really lucky and find someone that’s willing to hand over all control to you: here’s your login details, here’s how to make some minor changes and add some blog posts. And then what? You’re all on your own. Learn as you go. Do you suddenly have to become a web developer to work out how to add a new page? Or are you back on the phone to your designer saying you need to make changes which leads to more dollars being exchanged. Some designers or developers will probably be happy to give you training on how to do these things yourself but do you really have time to do that and learn it all from scratch? Isn’t that why you outsourced the build in the first place?? Well, BiziChix might be your answer so you are supported. And your website can grow and change over time, just like your business. Let’s talk money. If you are starting up a new business, I’ll bet you are trying to keep your expenses as low as possible. So paying a designer a couple of thousand dollars to set up your website is probably a really big risk. And I know in my case, it just would not have been justifiable. My husband and I just did NOT have a couple of grand lying around to spend on a website for a business that may or may not take off…. We simply did not have that money. We had bills, a mortgage and kids to care for. So what is the alternative to spending big? have the ability to change the look of your site so it’s not stuck in a time warp. We offer modern, amazing websites designed for cake decorators and bakers. BiziChix sites are built in WordPress, completely managed for you AND have the easiest, quickest editor that ANYONE can use it. Without a huge designer lump sum fee… In fact – without ANY FEE at all. My husband and I started BiziChix to cater for cake decorators that literally have no idea about designing or building websites but want to get seen online. Sign up for your FREE website now. 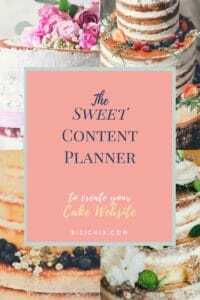 ← Worried you can’t afford a website for your cake business?